Post-recession Federal policy initiatives, such as secondary/postsecondary career pathways and gainful employment higher education accountability standards, prioritize the alignment of education practices with market-driven outcomes. Using longitudinal student record data merged from college and state K-12 data systems with the Unemployment Insurance wage records, this study examined the relationship between college and career success and the completion of dual credit courses in high school. During 2008-10, nearly 30% of graduates from 20 high schools who subsequently enrolled at a regional public technical college transferred an average of 6.0 dual high school and college credits. After controlling for several high school-level and individual-level factors, hierarchical linear models revealed that dual credit learners had significantly better outcomes than non-dual credit learners in terms of college course completion rates, second year retention, three-year graduation rate, as well as earnings in 2012-13. While our findings are limited to an upper Midwest community, they extend and highlight the positive relationship between high school dual credit completion and later college and labor market outcomes. Compared to dual credit courses completed on the college campus, courses offered at the high school and taught by high school career and technical instructors consistently predicted greater levels of college student success and better labor market outcomes. Additionally, several actionable student-level factors were associated with the significant college and career pathway outcomes, including high school preparation in mathematics. At both the national and state level, post-recesssion education policy has centered on improving the economic and marketplace returns, especially for secondary and postsecondary students and the institutions they attend. To wit, over the past five years, legislative, fiscal, and regulatory priorities have called for: (a) college and career readiness as a benchmark standard for the new Every Student Succeeds Act of 2015, (b) career pathways framework for state-level alignment of Federal investments in employment training, adult education, and vocational rehabilitation (U.S. Departments of Education, Labor, and Health and Human Services, 2012), and (c) adding graduates’ wage and employment to college performance standards (U.S. Department of Education, July, 2015). More than 30 states now have performance funding in place for colleges (National Conference of State Legislatures, 2016), including several in which graduates’ employment and earnings are among the criteria used to document institutional performance. Nothwithstanding the current debates surrounding the efficacy of market-driven education policy initiatives (Brown, Boser, Sargrad, & Marchitello, 2016; Darling-Hammond, Wilhoit & Pittenger 2014), there is an absence of compelling research and evaluation evidence informing how well particular career-technical education policies and practices work under particular conditions for various groups of students (Gamoran, 2011, October 12 ; U.S. Department of Education, 2014). In this regard, the Independent Advisory Panel for the recently completed National Assessment of Career and Technical Education (2014) argued that assessing the impact of career and technical education (CTE) on student attainment and achievement “requires timely access to student-level longitudinal data on course-taking behaviors, proficiency in core subject and career areas, and post-high school behaviors (e.g., postsecondary education, workforce activity)” (p. 6). According to the Panel, only two states provide leaders with access to such actionable data from their State longitudinal data systems. Among the critical questions longitudinal data sets are able to answer is the conditions under which promising practices – such as completing and transferring dual credit high school/college course credit – are capable of providing students with higher levels of success as they pursue a technical education career pathway beyond high school. For example, in 2011, 76% of U.S. high schools reported that students took at least one dual enrollment courses (DE) with an academic focus, while 46% reported students completing dual enrollment courses with a CTE focus (Thomas, Marken, Gray & Lewis, 2013). To be sure, dual-credit academic course completion has been widely implemented and carefully studied using national data sets (An, 2013 ; Swanson, 2008), as well as integrated state, local, and college databases in Florida, Texas, Tennessee, California, Washington, and New York City (Allen & Dadgar, 2012 ; Community College Research Center, 2012 ; Cowan & Goldhaber, 2015; Giani, Alexander & Reyes, 2014 ; Karp, 2013; Speroni, 2011). These studies have used advanced analytical tools to examine the net direct and indirect influence of “academic dual credit learning” experiences in high school on postsecondary outcomes, while controlling for other observed factors (e.g., student motivation, parental expectations, peer influences). However, albeit the recent increases in the rigor of dual credit study designs, considerably less is known about the influence of “CTE dual credit learning” experiences on student success in starting and completing career pathway programs in two-year colleges (Wang, Chan, Phelps & Washbon, 2015; Zinth Dounay, 2014). Additionally, others argue that because most states and school districts offer an array of high school dual credit courses (e.g., Advanced Placement courses, International Baccalaureate, Early College High Schools, Project Lead the Way, and varied state postsecondary credit options), research is needed to understand the comparative benefits of various dual credit course offerings (Giani, et al., 2014). In addition, beyond the comparative benefits of CTE dual credit courses, relatively little is known about the factors and practices that contribute to student success in subsequent college or workplace settings. To bring these promising practices to scale, more knowledge about how they work, for whom, and under what conditions is also needed as studies comparing the location, staffing, funding, and outcomes are not prominent in the literature. For instance, roughly two thirds (67%) of the high schools offering CTE dual credit courses in 2010-11 reported using only high school instructors (Thomas et al., 2013). Given these circumstances, Zinth Dounay (2015a) argued that it is imperative for states to ensure that course content and instructor qualifications are in line with those used in traditional college courses. Affirming Zinth Dounay’s assessment, the Higher Learning Commission (HLC, 2014) recently issued guidelines to institutional peer reviewers on the standards for accrediting institutions that engage in dual credit partnerships with high schools. The core accreditation standards were expanded to include “dual credit courses and programs” comparable course pre-requisites, course rigor, faculty qualifications, and access to learning resources. Since many high school CTE instructors lack the qualifications to teach at the collegiate level, studies of dual credit programs must inform the viability of these standards, particularly in secondary and postsecondary CTE areas where instructors’ industry experience has often been considered an important qualification. Equally important, the capacity for studying and tracking regional and local variation in student achievement and success has expanded. As Gamoran (2011) noted, state longitudinal data systems now permit educators, researchers, and policy makers to monitor student achievement trends at various points in time and across schools and classrooms. “Yet too little is known about the conditions under which achievement differences are produced. [The profession] need[s] more research . . . that links school conditions and instructional practices to student outcomes. . . . This type of work is especially critical because successful implementation of science, technology, engineering, and math (STEM) programs may depend on contextual factors such as leadership and professional supports” (p. 9). Given the highly diverse array of state and local options for implementing dual enrollment and dual credit programs (see the Education Commission of the State’s 50-State High School Reform Database; Zinth Dounay, 2015b), inter- and intra-state policy variation is considerable, or permissible, when examining program components, access, finance, transferability, and program quality standards. Local information and knowledge about the design and implementation of programs that produce better outcomes guides both the implementation and improvement of CTE dual credit programs. Thus, building a robust understanding of the outcomes and key program implementation features of dual credit programs on a local or regional basis is essential to the quality and sustainability of CTE programs. What student- and school-level demographic variables are related to students’ dual credit history? What types of dual credits are related to 2-year college students’ early academic success in terms of course completion rate, and second-year retention? What types of dual credits are related to students’ three-year graduation/completion status? What types of dual credits are related to students’ labor market success in terms of employment status and annual income? We examined the factors associated with dual credit CTE offerings and student success in a regional high school/technical college network in an upper Midwest state.The target sample included near 2,300 students from 20 high schools who completed dual credit high school courses between 2008-2010. We focused on students who used their dual credits in a local institution. In addition to estimating the benefits of dual credit courses, our longitudinal education and workforce data set allowed us to consider the importance of other factors associated with student decisions in the high school-to-college-to-work transition. In the time period examined (2008-10), three distinct forms of CTE dual credit courses were offered: Youth Options, Transcripted Credit, and Advanced Standing (see Table 1 for definitions). In this regard, Barnett and Andrews (2002) assert the importance of defining and differentiating between dual credit and dual enrollment. In this study, all three options (see Table 1 for the definitions) provide students with exposure to college-level content, however students in the Advanced Standing option do not receive a college transcript but may subsequently receive college credit once they enroll. A deeper understanding of the relationship between CTE dual credit course implementation practices and post high school outcomes in a single community provides an evidence-based template for studying, evaluating, and improving dual credit courses. This template can guide future CTE innovations, as well as inform the design of additional evaluation and research studies of dual credit practices. Students apply to the school district, then to the college. If accepted, school district pays tuition, fees, and book costs for up to 18 credits. Technical college curriculum, grading policies, and standards established in an articulation agreement. A cost-neutral arrangement is negotiated in a contract. Credit in escrow. Students apply for credit once enrolled in a WTCS program. *The FVTC TC course is delivered at the high school by an instructor who meets the state secondary and WTCS certification teaching requirements in particular technical fields. In 2007-10, no TC general studies courses were offered. For each TC course, a Dual Credit Memorandum of Understanding (MOU) and contract are written and annually updated by the high school and college. The MOU for each course specifies the FVTC standards for competencies, assignments, grading policies, textbooks, and software (if applicable). High school instructors must attend a Fall FVTC Articulation Workshop every other year. ** For AS courses, the high school curriculum is reviewed annually by FVTC faculty and competencies are judged to be equivalent or comparable. A formal AS Agreement is written. AS faculty must attend a Fall Articulation Workshop. Students enroll in and complete the high school course which is taught by a high school teacher with current technical education certification at the high school. Once students enter a technical college AAS or certificate program, they request a high school transcript review to receive credit for the AS courses they completed. An annual statewide record system is maintained by the WTCS and publicly available, which documents the TC and AS courses approved by each technical college. Source: FVTC (2015). Figure 1 presents a conceptual framework for positing and addressing the research questions. As described below, we assumed that both student- and school-level indicators shaped students’ decisions about completing CTE dual credit courses in high school. The lower box describes the three types of high school CTE dual credit experiences examined, as well as the four broadly defined CTE career pathways in which dual credit was earned. As suggested by three of our research questions, we were primarily interested in assessing whether any dual credit experience predicted college and labor market success during the five years beyond high school graduation. We measured student success with several typical outcome variables (e.g., academic progress, retention, graduation, employment, and annual earnings). Completion of high school dual credit courses enables students to explore and test or advance their interests in college and career pathway options while still in high school settings (Steinberg, 2014). Moreover, dual credit courses in selected states have enabled more students to complete high school, contemplate college attendance, and reduce some of the early college cost to students and families (Zinth Dounay, 2014). In Tennessee, for example, high school dual credit offerings are considered key strategies for meeting state-specific college completion goals (Karp, 2013). Dual credit courses – along with other college readiness interventions – are aimed at addressing one or more documented student needs: better academic preparation, development of appropriate habits of mind, increased psychosocial and behavioral support, greater exposure to college, better information about college and financial aid, and better alignment of high school and college curriculum and assessment (Venezia & Jaeger, 2013). The extent to which CTE-focused dual credit programs or courses help to address these student and systemic policy priorities, and inform other outcomes (e.g., improvement of youth employment and labor market participation outcomes) is substantially under-examined in the literature. More specifically, the systematic implementation of and outcomes derived from CTE dual enrollment programs warrant further research (Zinth Dounay, 2014). To date, several studies of dual credit CTE instruction using longitudinal data sets in New York City, California, Wisconsin, Florida, Minnesota, Texas, and Washington have identified positive career and college pathway outcomes. Table 2 summarizes the key findings from selected, robust longitudinal studies of dual credit programs that include CTE courses, technical high schools, and/or postsecondary CTE students. These studies used longitudinal student transcripts to track student choices, college performance, and labor market status following participation in a high school dual credit program, while controlling for differences in gender, race/ethnicity, academic ability, native language, family income, and other factors that are often associated with educational attainment and student academic growth. Each study followed a target cohort of high school graduates who completed various types of CTE dual credit programs. As noted earlier, advanced quantitative and quasi-experimental analyses were used to control for the student self-selection bias associated with elective high school courses. In some studies, CTE dual credit courses were examined as part of larger state-wide studies of dual credit completion and postsecondary access and attainment (Cowen & Goldhaber, 2015 ; Giani, et al., 2014; Karp, et al., 2007). Paradoxically, dual credit students in two states (Florida and Washington) had lower high school graduation rates, which researchers attributed to students’ accelerated interest in launching careers or college entrance prior to completing graduation requirements (Cowan & Goldhaber, 2015 ; Karp et al., 2007). The diversionary effects of high school CTE courses has been a longstanding concern in the literature (Kazis, 2005; Belfield & Bailey, 2011). Researchers have examined the negative effects of work, work-based learning, and/or high school technical education concentrations on academic performance and postsecondary education attainment, and found, at best, mixed results (Kazis, 2005). 2nd year retention; Total credits over 4 yrs. Comparison of AP and DE Completers in FL. DE was academic only, no CTE courses. All public FL high school graduates from 2000-01 and 2001-02. Of the 229,828 graduates, 29% completed DE and/or AP in high school. In examining an earlier version of CTE dual credit intervention – Tech Prep programs – Cellini (2006) found in a national longitudinal analysis that Tech Prep programs increase overall academic attainment. However, such programs may also divert students from four-year to two-year colleges and “actually reduce the probability that a student will attend a four-year college in the years immediately following high school” (p. 395). Rising tuition costs, declining real wages, and high unemployment rates for young adults who lack college degrees present similar questions about the diversionary effects for those not pursuing four-year college admission or credentials. Recently, Stevens, Kurlaender & Grosz (2015) examined the education and labor market returns for CTE degrees and certificates using administrative data and pre-enrollment earnings data from the California Community Colleges. They found that, most notably overall, post-program earnings returns were 12-23 percent higher for students in health care sector programs. The estimated returns for non-health care programs ranged from 5-10 percent. From a human capital and rational choice theoretical perspective (Becker, 1964; Mincer, 1974), these two studies also illustrate the potential for theoretical discontinuity. Higher earnings in certain career paths may divert students from their initial pathway selection. As the range of earning opportunities within and across career pathways increases within regional or local economic contexts, the prospects for college students being diverted to higher paying college majors is elevated (Carnevale, Cheah & Hanson, 2015). Additionally, high school dual credit and community college courses could motivate some students to pursue transfer paths to baccalaureate programs in common or related career pathways. In the Stevens, et al., () study, the authors noted that for the students who embarked on a CTE credential but eventually transferred and completed a bachelors degree, the earnings of the control group are benefited disproportionately by the decision of some to transfer. When students substitute their vocational choice (e.g., AAS degree or certificate) with a transfer path (e.g., BS/BA), the economic rational choice theory is conflicted. When certificate or associate degree recipients subsequently complete credentials at baccalaureate institutions, it is difficult to determine which degree/credential or institution was the source of the variability in the estimate of earnings (Jepsen, Troske, & Coomes, 2014). At the base of this conundrum is the problem of predicting or identifying early the students who are likely to change plans and transfer to a baccalaureate institution, or to transfer career pathway programs. Similar to studies of academic dual credit learning experiences (An, 2013 ; Speroni, 2011), CTE dual credit courses have noteworthy advantages on early college success (e.g., first year GPA, retention to second term) and overall college retention (e.g., fourth term retention, credit accumulation in three years). However, the evidence of longer term CTE dual credit effects (e.g., college graduation, employment and annual earnings) is, at best, limited or under-examined in the current literature. Looking beyond student outcomes, studies of CTE dual credit initiatives have also revealed important school-level and student-level factors that offer preliminary insights about how dual credit learning works for particular students or students who choose selected career and college pathways. As noted in Table 2, several CTE dual credit programs include specialized student supports, such as developmental classes or campus-based engagement activities, such as new student orientations. This section briefly summarizes the research literature on student- and school-level factors or indicators that associated with positive CTE dual credit outcomes. Some studies of local high school/two-year college dual credit programs have documented key benefits and promising practices. Harnisch and Lynch (2005) conducted in depth case studies of high school/technical college dual enrollment programs in three Georgia communities. They noted dual enrollment opportunities generated three major benefits not available in most high schools: exposure to college, increased options (i.e., seeing new possibilities for themselves), and narrowing down career choice options. More generally, dual enrollment programs forge stronger links between high schools and two-year colleges. Bishop-Clark et al. (2010) described the key observations of 64 students who participated in five physics and math dual credit courses offered at a regional, career and technical high school in Ohio. More than 94% of the students rated the dual credit course experience as excellent or good. Feedback from faculty members and students identified the most important program success factors as: creating an environment where relationships can flourish, allowing the instructors to identify the dual credit courses to be offered, and creating a strong mentoring relationship for instructors which focused on a rigorous curriculum and extensive assessment of student learning. The empirical evidence documenting the optimal location and instructor qualifications for dual credit courses is limited. However, a recent review of current practices (Borden, Taylor, Park, & Seiler, 2013) informs the aforementioned HLC’s new guidelines indicating college locations and college qualified personnel constitute the optimal delivery arrangements for dual-credit courses. Speroni (2011) examined the differences in postsecondary effects or outcomes for high school students completing Advanced Placement (AP) and academic (non-CTE) dual enrollment courses in Florida. Examining the longitudinal status of these particular student groups, Speroni found that both high school experiences were associated with positive but different outcomes. Dual enrollment students were more likely than AP students to go to college directly, and less likely to enroll in a 4-year bachelor’s program. For dual enrollment students, the effects were driven by the course location. Dual enrollment courses completed in local community colleges were associated with positive outcomes, whereas there were no effects for dual enrollment academic courses completed in high schools. In Texas an inner-city college preparation program Advanced Placement Incentive Program (APIP) provided AP courses to low-income, ethnically diverse students (Jackson, 2014). As part of the implementation design, high school instructors were provided with teacher training and 11th and 12th grade students and their instructors received payments when passing scores on AP exams were attained. Between 1996 and 2008, 58 urban high schools and approximately 138,000 students participated the AP Incentive Program. Compared to similar cohorts of students attending similar non-APIP high schools in Texas, students were more likely to pass AP exams, remain in college beyond the first and second years, and earn higher wages. By tracking two cohorts of program graduates for 10 years, the cost-benefit ratio for the program was estimated as 37:1 resulting in a lifetime earnings benefit of $16,650. The effects for Hispanic students were particularly noteworthy: 2.5% greater college completion rates and 11% greater earnings (Jackson, 2014). The empirical evidence on 2-year college retention and success is substantially limited, compared to the results for high school/4-year college sector. While CTE dual credit course enrollments represented nearly half of the high school dual credit offerings in 2011, the specific influence of these courses on students’ postsecondary success is under-examined compared to academic dual credit courses. Only one study has examined the labor market experience of dual credit completers attending community and technical colleges. The limited evidence regarding promising practices for students and educators considering CTE dual credit partnerships is largely descriptive and based primarily on qualitative data. Fueled by rising college costs and debates about appropriate, next-generation high school standands, several important questions remain unanswered for educators, researchers, students, and parents considering the efficacy of two-year college postsecondary options following high school. We used a correlational design to examine whether completion of dual credit courses was associated with success at the technical college and in the regional labor market. In addition to exploring the relationship between dual credit history and short-term annual income, we further examined how dual credit is related to income above the federal minimum wage. This approach not only sheds light on the plausible longitudinal effect of dual credit on a more meaningful measure of employment outcome, but also rules out, though imperfectly, students who only worked a part-time job or were still enrolled in a college. As such, this outcome variable is considered as income above poverty level. Finally, to capture the multilevel nature of the study design and data, all statistical analyses were conducted under the framework of hierarchical linear modeling (HLM; Raudenbush & Bryk, 2002; Snijders & Bosker, 2012). In states with comprehensive community and technical college systems, these dual credit CTE courses provide important foundational experiences in career pathway programs that culminate in workforce credentials (certificates, certifications, and diplomas) and associate degrees. In Wisconsin, the 16 two-year technical college districts have historically served a significant segment of the college-going, career-focused population. For the high school graduation cohorts of 2011-13, 17.4% of Wisconsin public high school graduates enrolled directly in a technical college (Ann Westrich, Wisconsin Technical College System Board, Personal communication, August 15, 2015). Our study analyzed the multilevel, longitudinal administrative and transcript data supplied by Fox Valley Technical College (FVTC), which included the complete transcript records and demographic background for each student. Specifically, the transcript record documents the three different types of dual credits high school students can earn and transfer to FVTC (see Table 1 for an explanation). These longitudinal records are matched annually with the Unemployment Insurance (UI) wage record files, housed in the Wisconsin Department of Workforce Development (2015), to provide employment and earnings data. The research team was able to access the de-identified data set for the sample, once a data sharing agreement was negotiated and signed by the institutional review board and the WTCS Office. In addition, given the nature of the transcript and administrative records, students’ dual enrollment records represent the dual credits transferred to FVTC. To allow a reasonable window of program completion, which is one of the outcomes of interest in this study, we focused on students who graduated from 20 public high schools in Fox Valley area in Wisconsin between 2008 and 2010 and enrolled in FVTC between 2009 and 2012 because the wage data of fiscal year 2013 (FY13) was the latest data available to us. These 20 high school were selected because in recent academic years, a large portion of new enrollees in FVTC graduated from these high schools, and the high school-level data were derived from the Wisconsin Department of Public Instruction database. In total, 2294 students were included in the analyses (see Table 3 for a student dual credit profile and Table 4 for a description of dual credit enrollment patterns). However, for the analysis of annual income in FY13, only students enrolled in FVTC in school year 2009-10 were included so that we allowed a three-year window, or 150% of the program duration of associate degree or two-year technical diploma, for students to complete a program. Therefore, the results should be understood as short-term educational or employment outcomes. For the sake of consistency, we adopted fiscal year (FY) as the unit of time in the analyses. Academic and employment outcomes. There are four academic and three employment outcome variables. The four academic outcome variables include whether the students transferred any dual credit to FVTC, overall course completion rate, second-year retention for those who enroll in programs lasting longer than one year, and graduation status three years after the first-time enrollment. In particular, courses that students withdrew were not included when calculating the course completion rate. These variables were derived from students’ transcript record. The three employment outcome variables include students’ full-time employment status (defined by whether students’ annual income in FY13 exceeding $15,080, based on the federal minimum hourly wage: $7.25 × 40 hours per week × 52 weeks per year = $15,080), annual income in FY13, and annual income for those who are considered employed full-time (i.e., earning annual income greater than $15,080 in FY13). These variables were extracted from the UI wage record file, and the annual income was the summation of the four quarterly income in FY13. Moreover, we applied logarithmic transformation using nature log as the base to transform the dollar amount into logarithmic value given the distribution of wage data (skewness = 1.05, kurtosis = 1.62, mean = $16,431.55, median = $14,757.00, SD = $10,724.97; minimum = $52.00, maximum = $76,164.00), in that the presence of outliers may influence the normality of the distribution of the wage variable and further affect the estimate of standard error. See Table 5 for a summary of the descriptive statistics. Dual credit record. We created three new variables that each represents students’ cumulative transferred dual credit in Transcripted Credits (TC), Youth Option (YO), and Advanced Standing (AS) courses from the transcript record as continuous variables as a response to the three distinctive types of dual credit implemented by the Wisconsin Department of Public Instruction (see Table 1 for the definitions). These credits were all successfully transferred to FVTC, and were regarded as key independent variables in the analyses except the model using dual credit as the outcome. Note. Descriptive statistics include the percentage (for categorical variables) or mean (standard deviation). The rest of the columns include the Pearson correlation coefficient. Academic backgrounds. Using the transcript record, we controlled for students’ Accuplacer arithmetic and reading score, the length of the FVTC programs, and college major. These are mostly dichotomous variables except the Accuplacer scores, so this variable was coded as 1 if the students met the criteria of the particular variable; otherwise it was coded as 0. Also, we created two sets of new variables to identify students’ field of major and the type of degree program based on the transcript record. The field of major was divided into four categories: engineering and manufacturing, other STEM-related fields, health-related fields, and all other fields (served as the reference group). The type of degree program is defined by the length of the program, which includes shorter-than-one-year technical diploma, one- and two-year technical diploma, and associate of applied science and transfer program (treated as the reference group). These variables are all dichotomous indicators, so this variable was coded as 1 if the students met the criteria of the particular variable; otherwise it was coded as 0. Demographic backgrounds. According to the administrative data, we controlled for students’ gender and race/ethnicity. Both of them are dichotomous, dummy-coded variables, which were accounted for consistently throughout the analyses. School characteristics. We further considered possible school-level factors that may be related to high school graduates’ success at FVTC above and beyond the student-level factors. More specifically, we considered three sets of factors using public data available on the Wisconsin Department of Public Instruction website: (a) academic factors (as reflected by the average 10th grade standardized test scores in reading and mathematics), (b) school poverty (i.e., percent of students from low socioeconomic status [SES]), and (c) FVTC-attending culture among dual credit students (percent of attending FVTC and transferring dual credits). These are all continuous variables that are modeled as school-level data (i.e., level-two) in all the following HLM analyses. All statistical analyses were conducted under the HLM framework. HLM is an extension of linear regression (Raudenbush & Bryk, 2002; Snijders & Bosker, 2012). However, different from linear regression that requires independence among observations, HLM is an appropriate technique when the observations are nested (Niehaus, Campbell, & Inkelas, 2014). In the case of the current study, students are nested within high schools where they shared the learning environment before attending FVTC. This characteristic is particularly relevant in the present study as we explore the way students’ academic effort in high school is related to their postsecondary academic and career achievement. HLM is deemed necessary, therefore, to account for this dependency of learning environment and to further examine how high school characteristics are related to students’ postsecondary learning outcomes, in addition to the individual-level characteristics. First, we examined whether the variance in the outcome variables is attributable to the school-level variables vis-à-vis individual-level variables by calculating the intraclass correlation (ICC; Niehaus et al., 2014) for the models with a continuous outcome variable. As a result, the low level of ICC indicates that the variance of the outcome variables was not strongly associated with these school-level variables (see Table 6). However, given that dual credit programs are highly contextualized within each high school or district, we proceeded with HLM analysis despite the low ICCs. Second, HLM with random intercept, which is the basic form of HLM that allows the variance of school-level variables to be freely estimated, was conducted for models with a continuous outcome variable, whereas a generalized HLM analysis (GHLM) with random intercept was estimated with dichotomous outcome variable to explore the relationship of students’ dual credit record, academic backgrounds, college major, and demographic characteristics to different academic and employment outcomes. Wage data is the only variable that contained missing data that 437 students’ UI wage data (19.0%) were not matched successfully with their administrative and transcript records. Possible reasons include that the students may not be employed in FY13, have moved out of Wisconsin, or be employed in the occupations that do not report UI data (e.g., farmers, railroad workers). Since we were not able to decide the reasons of the missing data, listwise deletion was used in the analyses of annual wage as the outcome. As noted in Table 3, about 30% of the students had transferred one or more Youth Options credits, Advanced Standing credits, or Transcripted Credits. The typical prior-credit completing student transferred 5.94 credits. 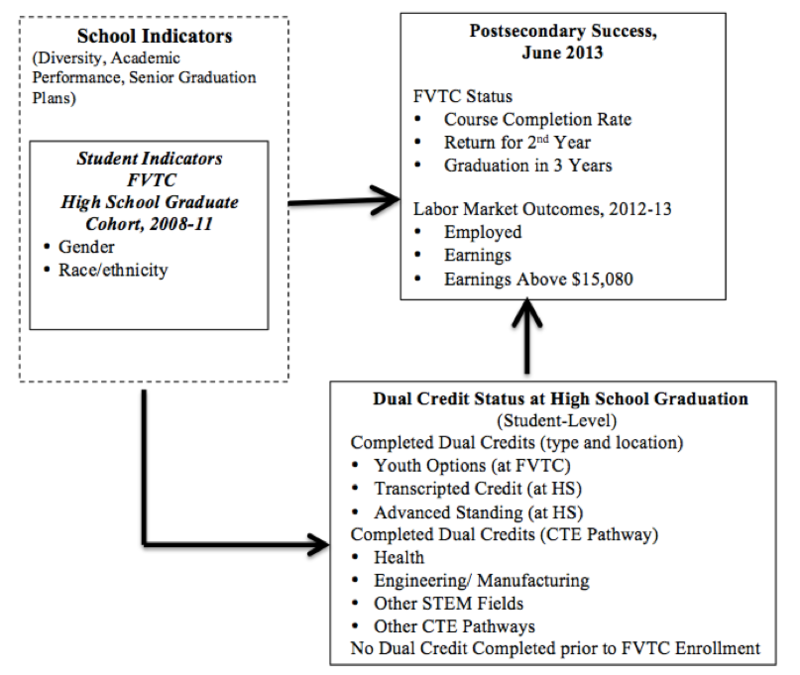 Table 4 provides a detailed analysis of the number of dual college credits transferred to FVTC. The descriptive statistics and the Pearson correlation coefficients are summarized in Table 5, and the results of the seven HLM analyses were provided in Table 6. The three types of dual credits are largely correlated with the outcomes of interest positively, with a few exceptions. Nevertheless, the magnitude is small, probably due to a large number of students who did not have any dual credits. Given the space limit, in the following paragraphs we briefly summarized the predictors that were significantly related to the outcome variable in each model. Because we were interested in six different college success outcomes, seven models (two models were estimated when the annual wage was the outcome variable) were proposed and estimated. In the first student outcome model we addressed the Research Question 1: What specific factors are related to transferring dual-credit? When considering all types of dual credit, we found that females on average had 20.1% higher chance to transfer any kind of dual credit to FVTC than males. High schools which sent more students to FVTC with dual credits, unsurprisingly, tended to send more students with dual credit to FVTC. The 20 high schools differed in the probability of graduating students who later attended FVTC with dual credits. However, high schools that enrolled more students from low SES backgrounds tended to have students with a lower chance to graduate students and later attend FVTC with dual credits. In the second Research Question we asked what types of dual credit were related to students’ early academic success in terms of course completion rate and second-year retention? Coined as academic momentum by Adelman (1999, 2006) and followed by Attewell, Heil, and Reisel (2012), it is important that students complete college courses in which they enroll, especially in the first year. In Table 6, all three types of dual credit were positively related to course completion rates. More specifically, students completing one more TC, YO, or AS credit are estimated to have a 2.0%, 0.3%, and 2.0% higher course completion rate, respectively. Higher course completion rates were experienced by several specific groups of dual credit completers, including those who were female and students with higher Accuplacer arithmetic scores. Also, students in short-term technical diploma programs, or those in health-related and other non-engineering/manufacturing STEM majors (e.g., information technology), tended to have higher course completion rates than students in the reference group. Nevertheless, students with a higher Accuplacer reading score tended to have a lower course completion rate. Students coming from different high schools also differed in the overall course completion rate. In the model of second-year retention, we found that transferring one more TC credit to FVTC is associated with 8.5% greater chance to be retained in the second year. Also, dual-credit students in engineering/manufacturing and health-related programs were more likely to be retained in the second year than their counterparts. No school-level variables were related to the probability of second-year retention. Note. ICC = intraclass correlation. TD = technical diploma. WKCE = Wisconsin Knowledge and Concepts Examination. Students in “other” FVTC programs and in AAS/transfer degree programs served as the reference group, so they were not entered into the model. Next, through Research Question 3 we sought to determine what types of dual credits are related to students’ three-year graduation/completion status. In the fourth GHLM model, students with more TC and AS credits have a significantly higher chance to graduate in three years. Students transferring one more TC and AS credit to FVTC would be 9.0% and 11.6% more likely to complete the degree in three years, respectively. Beyond dual credit completion, those graduating within three years tended to be racially/ethnically White or were enrolled in technical diploma programs. In addition, students in the health-related majors would have a lower probability of graduating in three years than those in the reference group. Finally, students with a higher Accuplacer arithmetic score, but a lower reading score, tended to be more likely to graduate within three years. Students from different high schools shown different probabilities of graduating in three years. The fourth Research Question centered on the types of dual credits are related to students’ labor market success in terms of employment status and annual income. In this case, the fifth model probed the factors related to employment using the UI Wage Records of FY13, and we found a pattern of uneven results. Specifically, in this analysis of employment status, TC and AS are positive predictors of being employed that transferring one more TC and AS credit to FVTC is associated with a 7.8% and 8.6% greater likelihood of be employed in three years, respectively. Males, students in STEM-related majors, and one- and two-year technical diploma programs were more likely to be employed than their counterparts. However, students from the shorter-than-one-year technical diploma programs would have a lower probability to be employed. In terms of overall wage in FY13, TC and AS turned out to be consistently salient factors that students transferring more TC and AS credits tended to report a higher annual income in FY13. Similarly, students in the STEM-related programs, as well as those in the one- and two-year technical diploma programs, tended to report a higher annual income than those in the reference group. Similar to the model of employment, students from the shorter-than-one-year technical diploma programs would have a lower annual income in FY13, and students from different high schools also shown differences in annual income. Finally, when focusing on students earning above the poverty-level of annual wage in FY13, students who transferred more AS credit, males, those in engineering/manufacturing majors, and those in the one- or two-year technical diploma programs tended to report a higher annual wage, while students who are racial/ethnic minority and those in the health-related majors reported a lower annual wage in FY13. Students from different high schools tended to report different levels of annual income. Students from high schools that reported a higher average of 10th-grade standardized test score in reading, but a lower average score in arithmetic, would report a higher level of annual income beyond the federal minimum wage. In summary, important insights about student factors associated with dual credit learning outcomes are evident. For example, the location and instructors of dual credit courses are clearly associated with all the assessed college success outcomes. TC and AS courses, which were delivered by FVTC-endorsed high school CTE instructors in high school labs, produced more favorable college outcomes than the YO courses. TC and AS course completion was also associated with modestly higher wages in FY 13, which is three to five years after the high school CTE courses were completed. Moreover, students’ subsequent choice of career pathway program and the length of program selected were both factors that are associated with students’ academic and career success. Students who chose longer-term technical diploma programs (e.g., 1- and 2-year technical diplomas) and students choosing engineering/manufacturing majors had significantly higher FY 13 employment rate and annual wage, when compared to students choosing shorter-term technical diploma programs, or health and other program pathways. While students pursuing short-term certificates (less-than-one-year technical diplomas) had significantly higher graduation rates, they also experienced lower employment rates and wages than others. As foreshadowed by the low ICCs across the statistical models, school-level variables were seldom salient in predicting students’ academic and employment outcomes, though students from different high schools differ in most of the outcome variables. This result indicates that students’ effort and decisions (e.g., choice of major) play an important role in predicting these achievements. Moreover, our models did not capture the school-level characteristics that induce such student-level differences, with the only exception of annual wage beyond federal minimum, in which the average WKCE reading score is positively related to students’ earnings five years or so beyond high school. Of the three high school CTE dual credit practices explored, Transcripted Credit and Advanced Standing were positively related to college success and annual earnings at age 22. Students of varying demographic backgrounds showed different chances of achieving academic success. Male students outperformed females in employment and the annual income above minimum wage. The relationship between dual credit completion and college and labor market outcomes was influenced, most likely, by several variables associated with student decisions and academic choices after high school graduation. However, the dual credit learners who experienced better success chose to: (a) enroll in longer technical diploma programs and avoid short-term certificate, and (b) select manufacturing and engineering program pathways over health and other non-STEM, non-health programs. Two additional factors were associated with dual credit arrangements and higher levels of college and labor market success. Students with higher Accuplacer arithmetic and reading scores tended to have moderately better performance in college. Compared to dual credit courses completed on the college campus (YO), the courses offered in high school and taught by high school CTE instructors (TC and AS) consistently predicted greater levels of college student success and better labor market outcomes. As both the review of literature and current, on-line information provided by national organizations and think tanks suggest, a key next step in addressing the national college completion goals is gaining a better understanding of the policies and practices associated with the promising outcomes (see, for example, the Complete College America initiative at http://completecollege.org/). Those associated with dual credit programs and partnerships are especially important (Giani et al., 2014; Karp, et al., 2012). This study highlights how local data-driven findings can broaden the current understanding about CTE dual credit courses and students’ postsecondary and labor market outcomes. Additionally, we identify some of the student factors associated with students’ subsequent success. In 2008, Lewis and Overman (2008) reviewed the status of three major CTE-focused high school dual credit studies and concluded that once students enter postsecondary education, they generated only marginally better (4-5% higher) student success rates compared to non-dual credit completers. After reviewing the work of Karp et al. (2007), Kotamraju (2005), and the early evidence on Early College High Schools (American Institutes for Research and SRI International, 2006), they argued that student self-selection bias and other unmeasured factors account for the unexplained variance. Despite the investment of many states in dual credit-driven programs of study (Zinth Dounay, 2014), the predicted gains for dual credit courses “… may not be sufficient to justify the effort to develop and implement such programs” (Lewis & Overman 2008, p. 189). Since Lewis and Overman’s cautionary observation, this investigation and others have documented and generated more nuanced findings regarding the influence of CTE dual credit courses on students’ postsecondary success. The present study demonstrates that high school CTE dual-credit courses are salient predictors of college success and labor market outcomes for technical college bound students. Clearly, dual credit learners outperformed their non-dual credit peers by substantial margins in college retention and completion. The earnings outcomes were particularly promising for those selecting longer-term career pathway programs in higher wage sectors. Our results, which include additional measured factors and additional success outcomes, suggest that both the college and labor market success rates of dual credit students, could, in some communities or regions, be substantially higher than Lewis and Overman (2008) argued in their review (7.8% to 11.6% higher when transferring one more dual credit in the current study). Most studies of dual credit programs are centered on courses delivered on college campuses, which require students to meet admission standards and in some states to possess personal resources to cover transportation costs, tuition, books, and other expenses. In our study, the positive results for selected dual-credit courses taught by high school teachers (TC and AS) versus the campus-based arrangement (YO) contrasts directly with the findings and recommendations of prior studies. Speroni (2011), for example, found positive student outcomes from dual enrollment programs only when the courses were completed on a college or community college campus rather than in Florida high schools. Moreover, the prospects for high school students completing dual enrollment courses in high school versus college campus settings favors the high school setting: 62% against 52% for academic courses, and 42% against 25% for CTE courses, according to the U.S. Department of Education (Thomas et al., 2013). Current college accreditation policies regarding faculty credentials for dual credit instruction (e.g., master’s degrees in content areas) pose some significant barriers for scaling up CTE dual credit offerings in several areas (Zinth Dounay, 2015a). In 2008, only 45% of CTE high school instructors held a master’s degree or higher credential (National Center for Education Statistics, 2015). As noted in the review of literature, these findings contrast directly with the recent HLC institutional accreditation review policies indicating that dual credit programs and courses should be reviewed to ensure that “comparable course pre-requisites, course rigor, faculty qualifications, and access to learning resources” are available. Clearly, research studies are needed to explore more fully the design, delivery, and effectiveness of dual credit instruction offered in both high school and two-year college settings. However, results from rigorous local program evaluations, such as the present study, can also be used to inform state and regional higher education accreditation practices and policies. Other factors associated with college readiness, including students’ choices in college, also appear to be associated with higher levels of college and labor market success. In high school and early college settings, students need to develop in depth knowledge about their education and its potential influence on their future success in the labor market. This study and many others illustrate the difference in earnings at age 22-23 for longer rather than shorter (less than 1-year) certificate programs and program pathways.. Specific information about the regional education-labor market dynamics can be valuable resources for educators, parents, and leaders who want to help students develop appropriate and viable individual career plans in high schools. For example, the sharing of labor market and college success data are part of FVTC dual credit partnership’s Summer Teacher Certification courses. Through these courses, high school instructors are encouraged to arrange multiple campus orientation visits, as well as industry observations for students, as part of dual credit high school instruction. Frequent workshops for high school counselors also feature data that helps schools and counselors to isolate factors and practices that offer promising, indirect evidence of impact on student success. By using similar data analytics, high school and two-year college partnership leaders can design, implement, and measure the influence or effects of innovations and interventions that are potentially effective. Finally, we would like to remind readers that the results presented and discussed in the current study are correlational instead of causal, despite the temporal order between the predictors and the outcomes, since some unobserved factors may be at play. Also, because of the inherent limitation of a single-site study, applying the results to other state and local context should be done with caution. We encourage future researchers and practitioners to conduct contextualized research, in that dual enrollment is deeply interwoven into state and local policy and economy contexts. One promising way is to include an array of relevant variables, such as the school-level factors controlled for throughout the present study, so that the unique relationship between students’ effort and their academic outcomes can be uncovered. This single-college analysis offers some useful insights to guide the local development and continuous improvement of CTE programs of study between high schools and local two-year colleges. More specifically, the study demonstrates strategies for using longitudinal, student administrative records to document college retention, college completion and labor market outcomes. By controlling for several student and school-level factors to predict short- and longer-term outcomes, the analysis revealed both promising and problematic outcome patterns, which, in turn, generated robust information for promoting, as well as improving and strengthening CTE dual credit practices and policies. Overall, the evidence revealed strong postsecondary completion and earnings returns at age 22 for students completing more dual CTE credits in high school. Congruent with previous research, dual-credit CTE courses predict various patterns of college and labor market success when student and school-level factors are taken into consideration. College success and labor market outcomes varied based on students’ diversity, including gender and race/ethnicity. The student-level variables revealed that introductory technical college courses, when offered in high school settings by college-certified CTE instructors, are more frequently associated with students’ college success than when similar courses were completed on-campus by high school students. In summary, the study illustrated how these data analyses processes can collectively: (a) improve college success and labor market outcomes at the individual, program, school, or regional levels, (b) contribute directly to the national college completion agenda (White House, 2009), and (c) enhance the continuous improvement capacity of two-year college, high schools, and their partner organizations. For CTE leaders and instructors, these results provide a regionally-focused, evidence-based foundation for implementing programs of study between high schools and two-year colleges that are anchored in dual-credit courses. To support these efforts, state leaders need to advance the development of and access to K-16 education data systems that include real-time labor market information generated by State workforce development agencies. The Data Quality Campaign and the Workforce Data Quality Campaign websites (2015) provide success stories and resources from several leading states illustrating how high school, college, and workforce participation data can be integrated and used to improve outcomes for students, schools, and communities. To support these efforts, college and university teacher education/research faculty must develop partnerships with local CTE providers. By developing regional, Institutional Review Board-approved data-sharing agreements, regional learning alliances can be formed that allow CTE instructors and faculty to identify appropriate, high demand courses to be offered for dual credit. For existing dual credit partnerships, the college and labor market success patterns for CTE students and their high school-to-college spanning programs of study can be documented, evaluated, refined and improved, as informed by students’ retention and success rates. For example, California’s Cal-PASS PLUS initiative (see: www.calpassplus.org) has created an accessible and actionable pre-K through 16 system of student data, which provides “. . . actionable data to help improve student success along the education-to-workforce pipeline.” Regional Learning Councils foster collaboration within and between educational institutions using data to inform better instruction, help close achievement gaps, identify scalable best practices, and improve transitions. As suggested earlier, several key issues relative to CTE dual credit learning merit further research. With the limitations of the present study in mind, the following priorities for future research merit consideration: (1) experimental studies of dual credit learning experiences using random assignment protocols, (2) studies examining student and instructor perspectives on the key attributes of dual-credit learning experiences that make them effective, (3) studies that examine the efficacy of similar dual credit courses offered to advanced high school students in high school, college, and on-line settings, (4) studies examining the factors supporting, facilitating, and inhibiting the college success of dual-credit learners with disabilities, and (5) studies of the dual credit, integrated CTE-academic courses (e.g, Digital Electronics) and companion courses (e.g., Technical Mathematics and Manufacturing Processes). Adelman, C. (1999). Answers in the tool box: Academic intensity, attendance patterns, and bachelor's degree attainment. Washington, DC: Department of Education. Adelman, C. (2006). The toolbox revisited: Paths to degree completion from high school through college. Washington, DC: US Department of Education. Barnett, E., Andrews, H. (2002). Dual credit/enrollment in Illinois: A status report. Urbana-Champaign, IL: Office of Community College Research and Leadership, University of Illinois at Urbana-Champaign. Becker, G. S. (1964). Human capital: A theoretical and empirical analysis, with special reference to education. New York, NY: Columbia University Press. Gamoran, A. (2011, October 12). What makes for successful K-12 STEM education. Written testimony before the U.S. House of Representatives, Committee on Science, Space, and Technology, Subcommittee on Research and Science Education. Washington, DC: Author. Hughes, K. L., Rodriguez, O., Edwards, L., & Belfield, C. (2012). Broadening the benefits of dual enrollment: Reaching underachieving and underrepresented students with career-focused programs, New York, NY: Community College Research Center, Teachers College, Columbia University. Kazis, R. (2005). Remaking career and technical education for the 21st century: What role for high school programs? Boston, MA: Jobs for the Future and the Aspen Institute. Karp, M. M. (2013). Dual enrollment for college completion: Policy recommendations for Tennessee. New York, NY: Community College Research Center, Teachers College, Columbia University. Karp, M. M., Calcagno, J. C., Hughes, K. L., Jeong, D. W., & Bailey, T. R. (2007). The postsecondary achievement of participants in dual enrollment: An analysis of student outcomes in two states. New York. NY: Community College Research Center, Teachers College, Columbia University. Kotamraju, P. (2005, April). The Minnesota Post-Secondary Enrollment Options Program: Does participation in dual enrollment programs help high school students attain career and technical education majors and degrees in college? Paper Presented at the 47th Annual Council for the Study of Community Colleges Conference, Boston, MA. Mincer, J. A. (1974). Schooling, experience, and earnings: Human behavior and social institutions No. 2. New York, NY: National Bureau of Economic Research. Raudenbush, S. W., & Bryk, A. S. (2002). Hierarchical linear models: Applications and data methods (2nd ed.). Thousand Oaks, CA: Sage. Snijders, T. A. B., & Bosker, R. J. (2012). Multilevel analysis: An introduction to basic and advanced multilevel modeling (2nd ed.). Thousand Oaks, CA: Sage. Speroni, C. (2011). Determinants of students’ success: The role of Advanced Placement and dual enrollment programs. New York, NY: National Center for Postsecondary Research. Steinberg, L. (2014). Age of opportunity: Lessons from the New Science of Adolescence. New York, NY: Houghton, Mifflin, Harcourt. Swanson, J. (2008). An analysis of the impact of high school dual enrollment course participation on post-secondary academic success, persistence and degree completion. Iowa City, IA: Institute for Research and Policy, Acceleration at the Belin-Blank Center for Gifted Education, University of Iowa. Thomas, N., Marken, S., Gray, L., & Lewis, L. (2013). Dual credit and exam-based courses in U.S. public high schools: 2010-11. Washington, DC: National Center for Education Statistics. Retrieved February 10, 2014 from http://nces.ed.gov/pubsearch. U.S. Department of Education (2014). National assessment of career and technical education: Final report to Congress. Washington, DC: Author.